Nightbird: Chilling Ayotzinapa killing: #EyeOnMexico, Will revolutionary Mexico remain the same? Chilling Ayotzinapa killing: #EyeOnMexico, Will revolutionary Mexico remain the same? ¿Qué trazar a los muertos, qué borrar, qué inclinar? What remains to trace the dead, what to erase, to tilt? ¿Ese sobre de órganos equivocados? That what is on their corpses mistaken? ¿La imagen detenida en pacientes frentes? The image stamped forever on their patient foreheads? ¿Qué recuerdo detenido invocar? ¿Hasta qué? What memory still remaining can be invoked, until what? ¿Cómo reduce el pasado sus ahoras? How to reduce the hours of the past? ¡Llénese el país de manos! Let the country be filled with hands! The Day of the Dead in Mexico 2014 was filled with more pain than ever. expressing still, their hopes for peace, need for it, a society free of racism, need it. A society free of hunger, must be it. A society free of killings a must! The military parade on Mexican Revolution day celebration today makes no sense today. It is stopped. Tonight, Mexico stops and everyone I know marches into the streets of different towns. Ayotzinapa killing is chilling and even when all the other killings were stilling souls every day as Nightbird flew... this time we join the uprising. Today (20th November) is the big day: Massive demonstrations all over the country and the entire world. To demAND peACE, to demAND and eND to governMENT corRUPTION. I am sure there will be at least one milLION mARCHERS in MEXICO City. People are FINALly AWAKEning to the horrors they have been living since 2006, which produced a country filled with MASSGRAVES. Juan and I are going to march in our city. Mexico is UPRISING. I have never seen such a thing. Such indignation, in a very subdued people... but the 100 000 victims of that war and the 30 000 still missing seem to deny the fact that Mexicans in general are very sweet people non-violent people. and not dared touch anyone because the eyes of the world are on us. 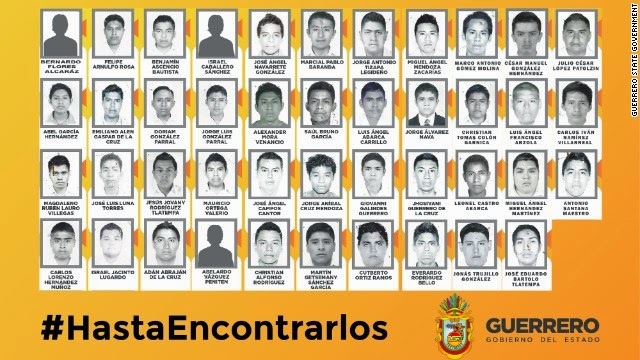 Not a single shot will be fired today: they just cannot ruin their image (Nightbird hopes so as she writes as it happens) more than this Ayotzinapa killing has already done. I have seen very moving gestures of solidarity, love and caring since these unspeakable acts happened. It is encouraging. An interesting thing is people have come out not just in Spanish. Nightbird got information just when she was asking where we are with all these languages...That people are talking in their own languages about their pain: Nhauatl, tzoltzil, Maya, Zapoteco, Zoque and Purepecha and more. Yes, pass on that microphone and make it louder. "Maybe this is the awakening of a great and battered nation. People are still demanding that the students return alive, hoping against hope and knowing that when they are asking for this, they are, hopefully preventing other deaths. Eye on Mexico please, it matters for the world..."